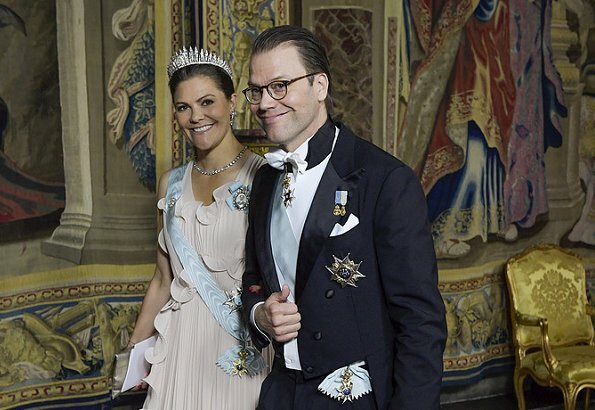 On May 31, King Carl XVI Gustaf, Queen Silvia, Crown Princess Victoria, Prince Daniel, Prince Carl Philip and Princess Sofia of Sweden hosted an official dinner (Sweden Dinner) at the Royal Palace of Stockholm. 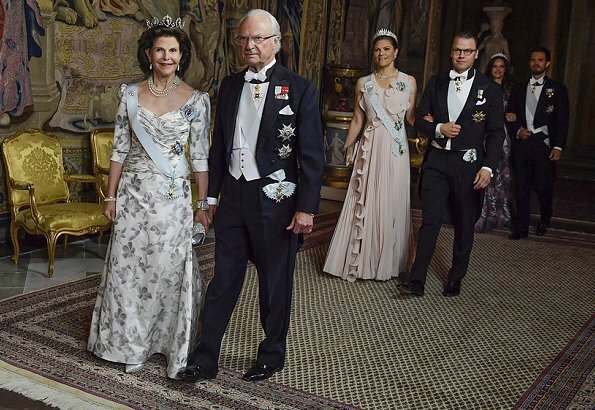 With the Sweden Dinner, the Swedish Royal Family wants to pay attention to people who have made significant efforts locally, regionally or nationally. 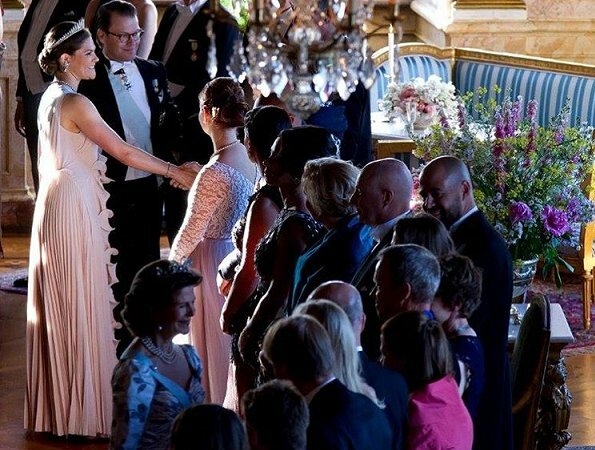 Crown Princess Victoria wore a pink gown from the H&M Conscious Collection. 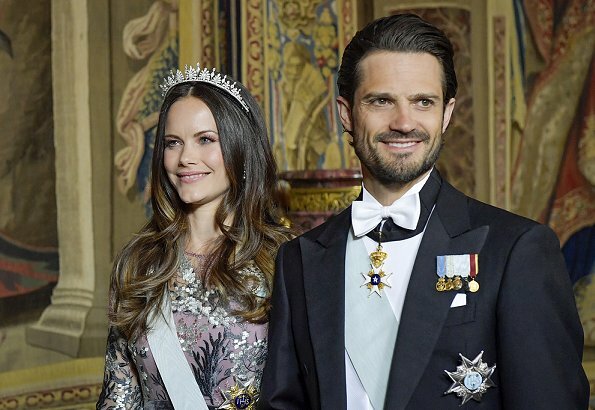 Princess Sofia wore a new custom gown from Ida Sjostedt. This time Silvia looks the best. Sofia's dress wouldn't be bad but her hair is so unflattering that I can't pay attention to her dress. The only royal who can wear a tiara with hair down and not look ridiculos is Madeleine in my opinion, because her hair has enough volume. I don't like Victoria's hairstyle and dress. Maybe some colour would've been good. I agree, Princess Madeleine looks so good, wearing a tiara wirh her hair down. I don’t think,that Princess Sofia can’t wear her hair down with a tiara. I my opinion it depends only on the styling Onestly I don’t like offen the hairdo of Princess Sofia. She should change her hair stylist and her stylist auswell. Yes she should get a good hairdresser. That would make all the difference. Princess Sofia has very high forehead (to see if she wears a ponytail) so the hair is usually styled so, so my opinion. CP Victoira has thick heavy hair and many hairs which makes hair styling not easy. I myself have the same hair and wear it very rarely unbound. I can therefore understand her styling. OMG! Victoria and Sofia's hairstyle is horrible and so unflattering! It must be embarrassing when a 74-year-old woman outshines you in the fashion department. And all Sofia did was plop a tiara onto her hair, the busy mother (oh, Victoria is as well) couldn't be bothered with a nice updo; the long hair with the flowery-patterned dress is way too busy. Agree, this is embarrassing ! Let's not forget to remember they both have nannies. That makes life very unbusy compared to a average mother who is doing it all herself. 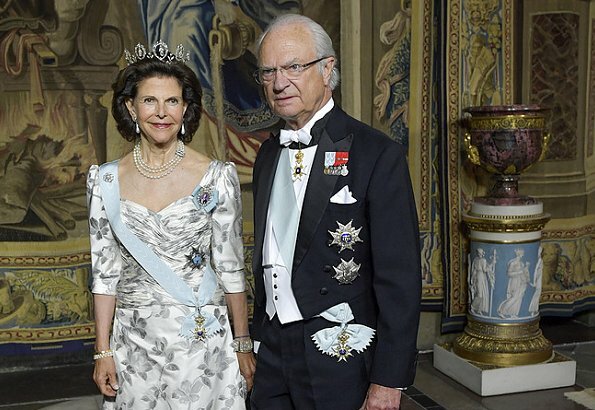 No doydo Queen Silvia is the best tonight. Sofia's dress is ugly, and makes her look much older. And Victoria's outfit is a light summery dress, poor for a royal event. The dresses on Silvia and Victoria are very pretty. Sophia's dress is just ugly in my opinion. Victoria's hair is much better than Sophia's. This is the time when long hair should be up, especially with the crowns. Well done, Victoria! I fully agree with you Anon1.08! and not with the other comments restrictive about Victoria. She looks very nice! An evening gown can also be a bit "summer time". Sofia's dress is a bit over-the-top but might have worked with a more restrained hairdo, as others have said. I think all three Ladies look very nice. Victoria with her Trademark hairstyle, I would have liked Sofias hair styled different,if not up then pulled back.Each of us has a different opinion,but lets be nice. None of these dresses is awful but we've seen better. Agree that Silvia is the best, both for the style of dress and the hairstyle. She looks amazing for her age. Victoria is okay but a bit underdressesd for the event. Her hair is no different from usual=--why would we expect it. Sofia is the one who disappoints. IN the third pic her dress matches the carpet and her hair is unflattering and just wrong with the tiara. Love all the tiaras of course! All the royal ladies looked exquisite! Look for more detailed photographs on the Internet. The reason behind all of the ladies wearing diamond tiaras are the dresses. Princess Sophia's dress is all shimmering silver. Stunning! Pricess Victoria's dress is a very fine sculptural number worthy any haute couture runway. The charp spikes of her fringe tiara are a perfect juxtoposition of the plisè meanders. As the anonymous points out above: Let's be nice, regardless of our opinions . Sofia's gown is just too busy plus she has her hair down, maybe another outing on this with an updo? CP victoria's dress might be a wiser choice for occasions not requiring sash? Safest choice goes for the Queen. Sofia too much 70-ies.Victoria should skip HM.I don't like what that company does with children working in some countries. The winner takes it all……… and that is Queen Silvia! Victoria's haiirstyle is the same as usual and she seems simply to love H&M Conscious Exclusive dresses, but not all suits her, this one does not. Sofia's tiara and long hairstyle didn't match, she is beautiful, but she gives the impression of a Barbie doll look! Love Silvia's hair and dress. I actually like Victoria's dress and hair. It's a nice summery evening dress and she has a nice coiffure. Sofia's hair and dress loks heavy and a bit boring. Agree 😀 for me Silvia wins this time. Sofia is a small person and her evening dresses are usually too big and bulky. 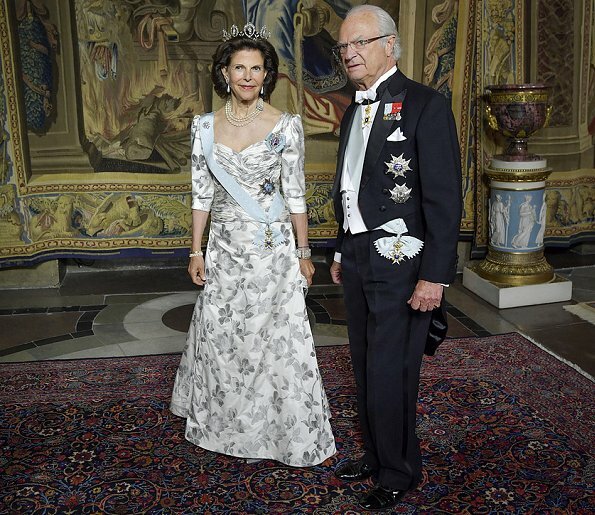 Queen Silvia is also a small person but her tailor is much better. All three ladies look beautiful!! 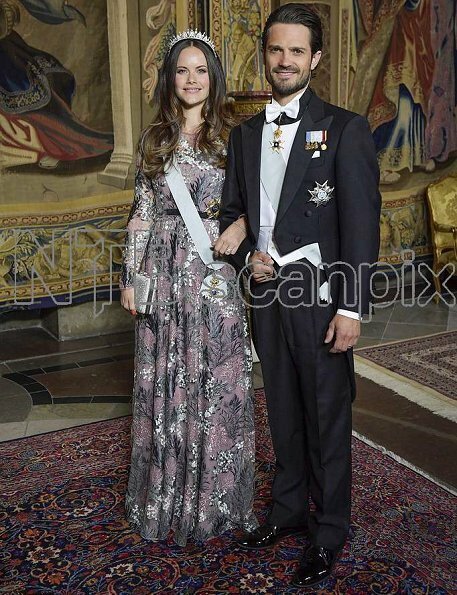 Queen Silvia's dress flatters her figure, CP Victoria's dress is so soft and feminine and P. Sophia's dress is beautiful and her silver shoes are gorgeous!! Good job and thumbs up to all three. It's the best comment ever!! I totally agree! I like Victoria's dress, it is a beautiful color and she looks lovely. I agree that Sofia's hair needs to be up when she wears a tiara. I don't think any of them should have the hair down with a tiara but agree that Madeline probably does it best. It just seems that the tiaras call for an updo. Also my personal opinion is that I don't care much for the long gowns with all the prints and flowers all over them, the plain colors look so much better but it seems that patterns are the current rave. I like Silvia´s and Victoria´s dresses, Sofia´s dress makes nothing good to her. Silvia and Victoria have also nice up-does. Victoria looks wonderful in this dress, lovely! Silvia looks good too, but Sofia...? I like her, but this dress...? No! Silvia has the most wonderful and dignified style. She just exhults class and warmth all at the same time. Her dress is very stylish (did you notice the back?) but feels fresh and interesting, whilst appropriate for her role and age. She is still a beautiful lady. Victoria is a big supporter of ethical and sustainable standards and it feels only natural that (for a future Swedish Queen) she would take every opportunity to promote an ethical line from a Swedish company. Having said that, like others said above, this company was one of the first to actually ruthlessly exploit child labour in Asian countries. So they have a long way to go to counter-balance all that (however, I understand that they are not necessarily doing that anymore-at least so they say). Also, this dress is a nice design, summery colour and fits Victoria quite well, but (like others already said) the additional sash, insignia make for a busy and confusing look. Sophia... well, that’s a completely other story. For a petite person, a dress with a lot of fabric always just emphasizes the shortness. A busy pattern on a lot of fabric is literally looking less like a dress and more like a fussy curtain (one from Grandma’s country house). And then she’s also chosen a pattern with shiny threds and dark on dark colours. Plus the sash and so on. Hard to imagine how she could possibly have been Lenore inspired. I won’t even talk about her hair... she actually looks beautiful with a chignon and / or her hair up (She and Victoria should switch hair styles). 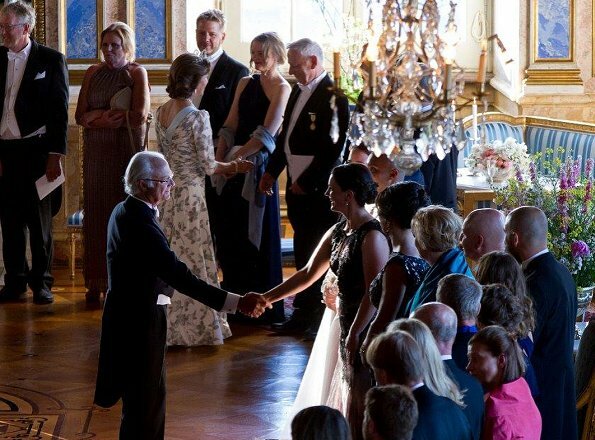 I appreciate how the Swedish royals give a sense of special occasion to events like this by wearing their tiaras. I am sure their guests felt great. 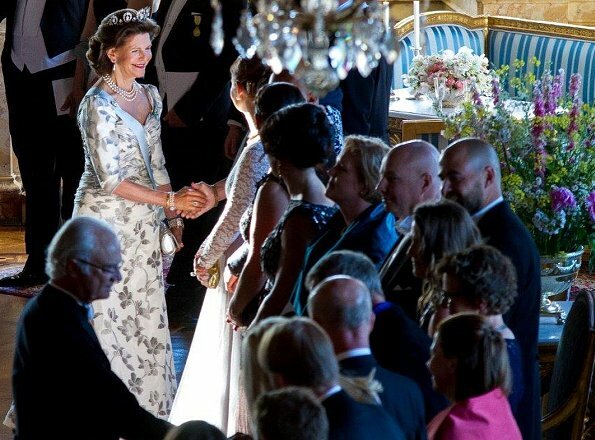 Queen Silvia looks very, very elegant, her gown is very flattering and the print is very becoming. Victoria's gown seems a little informal for an event where orders are being worn and Sofia's gown is a little busy and doesn't look quite right with her hair down. I think Sofia's whole looks would look much nicer if her hair was up. Silvia looks splendid. Gorgeous queen. Beautiful dress. 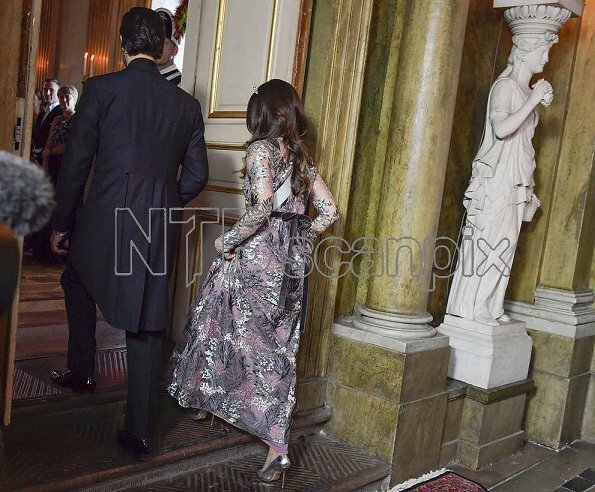 Victoria´s dress is lovely. I think she looks good, but I agree that the dress works better without a sash. And the colour is too pastel, too soft for her. Her same dress in white looked better with her colouring. And then Sofia. The fabric is exquisite. But she is drowning in that dress. And the curtain-like hair adds too the effect of ´too much´, ´too heavy´. To save the look, she needed to: put her hair up, open up the neckline, shorten the sleeves, streamline the bulk in the skirt, both to and make it more A-line (much like the queen´s) and to do more justice to the pretty pattern (to make it visible). Also, the lavender lining of her dress is too pale and washes her out, gives it a muddy look when viewed from farther away and the colours melting together. It really needed to be a much stronger colour to look more vivid.